St. Rose was born into a family with wealth and political connections August 29, 1769 in Grenoble, France. Her father, Pierre Francois Duchesne, was a lawyer, businessman, and prominent civic leader in Grenoble, while her mother, Rose Perier, was a member of a leading family from the Dauphine region. From the young age of eight, St. Rose had a desire to evangelize in the Americas, sparked by hearing a Jesuit missionary speak of his work there. She received a basic education at home from tutors, and religious education from her mother. Educated from age 12 at the convent of the Visitation nuns in Grenoble, Rose joined them in 1788 at age 19 without the permission or knowledge of her family. Initially they were violently opposed to her choice, but finally gave in. In 1804 she joined the Society of the Sacred Heart, which sent her to the United States in 1818. From the convent and school she founded at St. Charles, Mo. -- later moved to Florissant, Mo. -- she traveled over a wide area, founding schools for girls, doing charitable work, and finally ministering to Native Americans. 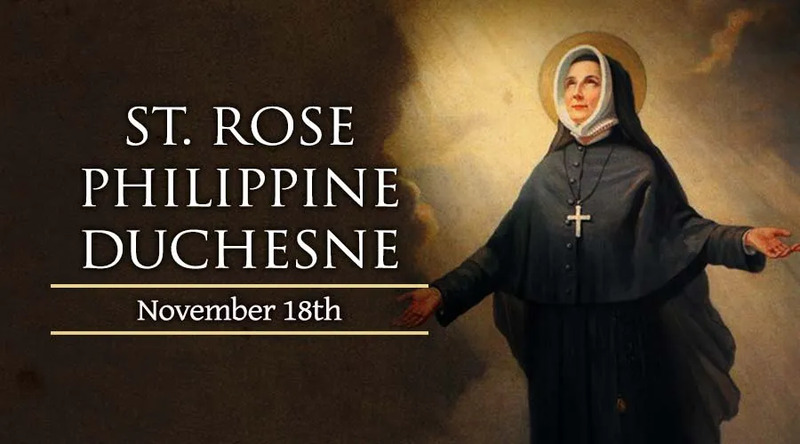 St. Rose Duchesne was a valiant missionary and a well-known benefactress. She spent her last ten years in retirement in a tiny shack at the convent in Saint Charles, Missouri where she lived austerely and in constant prayer. She died on November 18, 1852 at Saint Charles, Missouri. She was beatified on May 12, 1940 by Pope Pius XII, and canonized July 3, 1988 by Pope John Paul II. She is often referred to as "The Lady of Mercy," or " Woman Who Prays Always." Patronage: Opposition of Church authorities, diocese of Springfield-Cape Girardeau Missouri.